If you have ever done any kind of tile work in your house, you know that you will most likely have extra tiles at the end of your project. A great way to make use of those extra tiles is with DIY coasters. Even if you don’t already have tiles on hand, you will want to purchase some for this easy craft. Tiles are inexpensive and make great coasters when decorated. 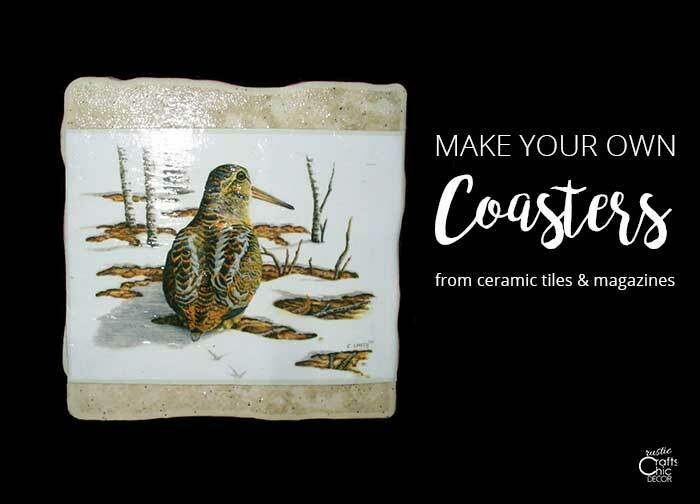 Everyone needs coasters and even if you already have enough of your own, you could make a custom set to give as a gift. The way to customize these for your own taste is to decorate them with some of your favorite magazine cut outs. This is also a great way to recycle old magazines once they have been read. You can find pretty florals and fun patterns in many magazines. If you don’t have magazines with good images, just purchase fun craft papers. Since we have a rustic cabin in need of some new coasters, I decided to make some using cut outs from a few of my husband’s old Duck’s Unlimited magazines. The magazines are full of great little pictures so I had plenty of options to choose from. Cut out pictures from a magazine and arrange them on each of your tiles. Use one large picture to fit the tile or a collage of smaller pictures. 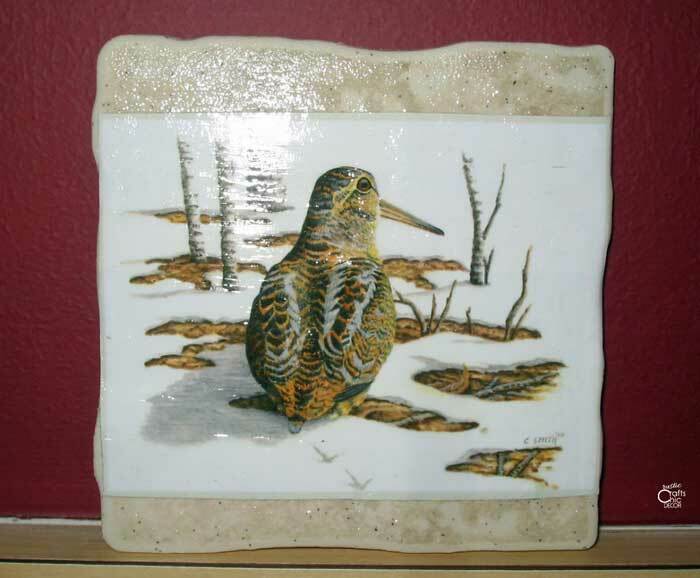 Brush decoupage on the back side of your cut outs and adhere smoothly to your tile. Apply another coat of the decoupage over the front side of the cut out once it is in place. Repeat for all of your pieces and let dry. Apply another coat of decoupage over the entire surface of the coaster and let dry thoroughly. Trace around the tile onto the rolled cork and cut the square out with an exacto knife. Glue the cork to the back of the tile with E6000 craft glue. Decoupaging is a great method to use for applying your cut outs since the decoupage provides a nice hard and waterproof layer to the picture once it is dry. This is perfect for a coaster which will need to be able to resist water stains. Depending on the look you want, you can use matte, satin, or gloss decoupage. I used gloss for this project but if I do it again I will probably use a satin finish. The gloss is a little harder to work with because it shows every tiny wrinkle in the paper. This just makes it take longer to get the image smooth. These coasters are super durable and fun to make. For more DIY coaster ideas, check out my post on making coasters from a pine log.